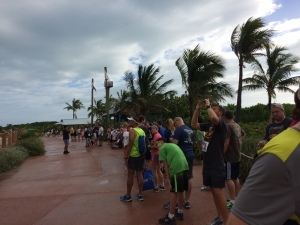 Be sure to check out Jennifer’s review of the Castaway Cay 5k as a part of runDisney’s Parks to Paradise Challenge. 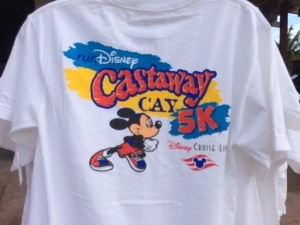 Earlier this year runDisney announced yet another new race challenge that got the Casual Running community all abuzz: the Castaway Cay 5k. Its simple, all you have to do is complete a designated race during a runDisney race weekend in Walt Disney World in Florida, and after you finish enjoying the most magical place on Earth, you hop on the Disney Dream and complete a 5k race in the Bahamas. Wait, what? Really??? So you spend a weekend enjoying Walt Disney World, and then you get to hop on a 4 night Disney Cruise Line (DCL) Cruise, run a race in paradise, and get a really cool medal to show for it? Yeah, you are starting to get why Casual Runners were getting all excited for this. So the Casual Running Team decided that someone needed to go down to Florida, hop on a sailing of the Disney Dream, and test out the 5k course so that our readers could be prepared for the challenge. That responsibility fell to me. So my buddy Andy and I, along with 4 other friends and family booked passage on the dream, all in the name of keeping our readers well-informed! Since the official Castaway Cay Challenge does not begin until 2015, it did not really matter in what order I completed this race. Thus, while the Challenge requires runners to sail after completing a designated runDisney event, we chose to sail prior to my running of the 2014 Wine & Dine Half Marathon (full coverage of that event is coming, don’t worry, but here is the coverage of last year’s event: Part 1 and Part 2). The Dream is one of the 2 largest ships in the Disney Cruise Line (DCL) fleet, and 1 of the 5 largest passenger cruise ships in the world, and it is magnificent. We set sail from Port Canaveral, Florida, which is conveniently located east of Walt Disney World. 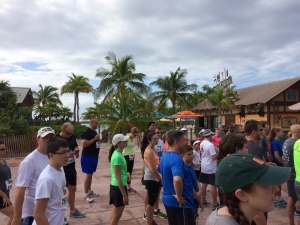 Castaway Cay is DCL’s private island in the Bahamas, and the 5k is offered, free of charge to all guests, age 10 and older, sailing on a cruise that stops at the island. All you have to do is watch your Navigator and sign up prior to the ship’s arrival on the island. For the runDisney challenge, however, runners are required to register in advance on the runDisney website and pay a fee (currently it is $40). Our ship docked in Nassau, Bahamas on the Tuesday before the race, and then sailed north to Castaway Cay. I signed up after re-boarding the ship in Nassau at the Port Adventures desk on deck 3. It only took about 3 minutes to do so, and it could not have been easier. There is no expo. At least on this sailing, the 5k was more of a fun run than anything else. We are waiting to see what changes are in store when the Challenge races take place. There are also no character appearances or on-course entertainment, but again, we are eager to see if runDisney adds anything for the Challenge races. There is no swag, but then again, this is a free race. Don’t worry though, as our cruise guides informed us, as this is a Disney event, the race does end in a gift shop! There was some Castaway Cay 5k merchandise on sale there. Castways, er, runners, prepping for the race and taking in the beauty of the island. Believe it or not, despite 11 half marathons and 2 full marathons under my belt, this would only be my second 5k. I know, I kind of have the whole race event thing backwards, but it is all good. I opted for a kit that included Layer 8 running shorts, a SweatVac race hat, a Reebok dry fit tank top, and Saucony natural series running shoes. Again I grabbed my Yurbud triathlon series headphones and my IPhone 5S. That’s right, no compression shorts or wrist bands, I figured that neither were necessary for a 5k. You receive a ticket instructing you to meet in a designated area, in this case the Evolution lounge on Deck 3 at 8:15 the morning of the race. There you will receive a quick overview of the course map. The goal is to have the runners be the first ones to disembark the ship once they are cleared to do so, which takes place around 8:30 am. You then walk as a group to the starting line for the 9:00 am start. Family can come along to watch the race, but everyone needs to bring their Key to the World Card and photo ID for getting on and off the ship. Our race included 90 runners, and I was informed that this is typical for the Dream. 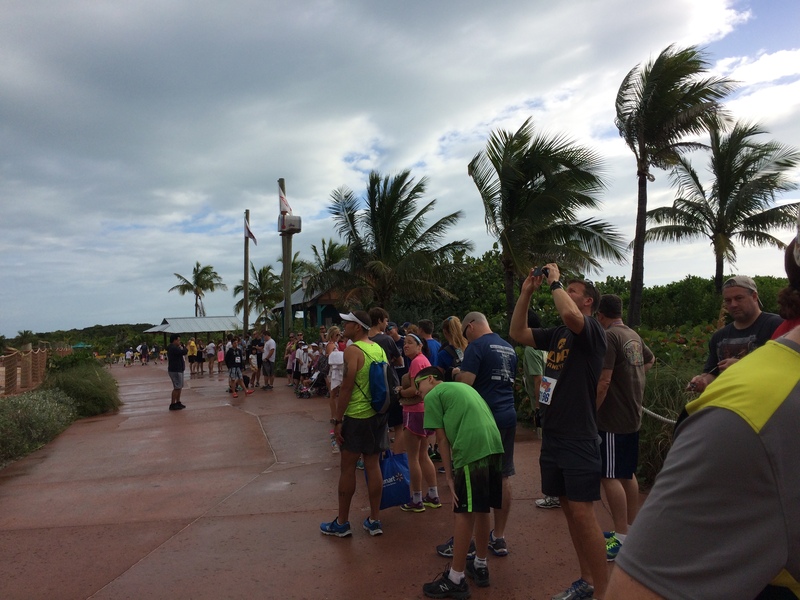 However, for whatever reason, the Disney Fantasy (a ship of the same size) usually draws 150-175 runners for its Castaway Cay 5ks. There is no fanfare for this race. Once you reach the starting line, there is an opportunity to use the restrooms and stretch, and then they do a group countdown and then everyone is off. Note, this is not a timed or chipped race, but they do have a clock that you can use for your own purposes. This race is a mass start, or at least, as “mass” as 90 runners can be, but you get the idea. I saw that the path was fairly narrow, so I hung near the back of the group and waited for everyone else to clear out before beginning. As I was in a foreign country, my running app was of no use (I was not paying for an international data plan), and so I simply started my music and my stop watch and took off when I was ready. The course goes along the walking path, past a roundabout, and then takes a left turn onto the airplane runway. As you can imagine, this area offers no shade from the Caribbean sun, which was very warm even in the early morning with temperatures already over 70 degrees. However, there is gorgeous scenery all around you for the entire course. Ready! Set! Run! Casually, of course. There is only 1 water station on the course, but it is strategically placed in a location that runners will pass 4 times, so it works out very well. At the water station we turned right at and proceeded counter clockwise along the bike path, which took us back to the water station, where we turned right back onto the runway. The course goes straight (and thus is flat and fast) to the entrance to Serenity Bay, which is the adults-only area of the island. We did a 180-degree turn, and proceeded back to the water station, where we turned left onto the same bike path. As I was proceeding – again counterclockwise as instructed – I noticed several runners running clockwise. We had a good laugh about this after the race as, despite the clear pre-race instructions to run counterclockwise on both circuits on the path, about half of the runners messed this up on the second lap. However, given the number of runners that day, it did not cause any problems, just some good laughs and embarrassed grins. Once back at the water station, you turn left onto the runway and right again back on the path where you started, finish at the starting line, and exit into the gift shop! It was a nice, simple, scenic course. Even though it is a fun run, it is a fast course, and the only real challenges are (1) the heat of the sun/no shade; (2) the 2 prior days of gorging oneself on the cruise ship before the race; and (3) the bars on the cruise ship. I managed to overcome all 3 without any real difficulty, though I did miss my goal time by 30 seconds. Oh well, I had an entire day in paradise to sooth my “disappointment”! Even though it is a free race, runDisney and DCL still provide all finishers with an SMO, well, its actually plastic, so I guess, as Steve has set the trend, that makes it a Shiny Plastic Object? It is black plastic in the shape of classic Mickey ears and has a sticker with the DCL logo. It is not fancy, but it is more than adequate for a free race. I am not sure why all of the ribbons say “winner” on them, but they do. Note, there will be a special SMO awarded to those who complete the Challenge, I have seen it and it is up to the usual excellent runDisney SMO standards as it features a cutout of the Disney Dream. After the race, some runners chose to start their day on Castaway Cay. I opted to go back to the ship to shower and grab breakfast with my travelling party. The walk back seemed longer, but I really needed the exercise to work off some of the massive amounts of food I consumed on this sailing. Given that this was a 5k, there was not much time for a full-on playlist after I included my traditional race start and finish songs (that I use for every race): The Muppet Show Theme, Home (Phil Phillips), Fantasmic! (exit music), and Ever After (Carrie Underwood). Thus, I inserted part of the Soundsational Parade from Disneyland and that would be it, but it worked out well. There is no reason not to run this race if you are on a DCL cruise. Itss free, its fun, and its easy to do. Not to mention, any exercise you can get on a cruise is worth it. Given that you can get off the ship first and start your day on a beautiful private island, is even more incentive to do so, even if you choose to walk the entire course at a leisurely – rather than a race – pace. So, if you are sailing DCL, enjoy the race, and bon voyage! The Casual Runner Team wants to hear from you. If you have any questions about anything we cover here on Casual Runner, if you have any questions regarding running gear or training for your own Casual Running needs, or if there is anything that you would like us to cover on Casual Runner, please leave a comment or email us using the links below. To ensure that you do not miss all of the great content from Casual Runner, please be sure to like us on Facebook, follow us on Twitter and Instagram, subscribe to our YouTube channel, and add us to your circle on Google+. Normally we would part by saying “see you out on the running trails,” but this time, we will part with a fond Bon Voyage!